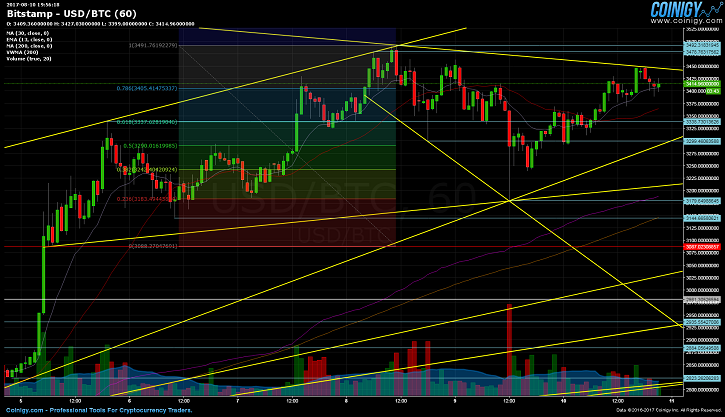 Bitcoin has managed to rather quickly bounce back in the last few days. Yesterday, a violent short-term pullback brought the price back down to $3,179, before rising yet again right above the $3,400 horizontal line. The $3,490 weekly high is stilling holding as a strong resistance level. If we are going to see a huge dash into the beyond, then the current high needs to be shattered as soon as possible. In the meantime, bitcoin cash has entered into a slow, but steady descending channel. The same situation is equally applicable to all three Bittrex trading pairs: BTC/BCC, ETH/BCC, and USDT/BCC. BCC has been keeping to a price that is largely below $300. This downward slide, on all of the corresponding trading sets, should be provisionally taken as a bullish sign for bitcoin. 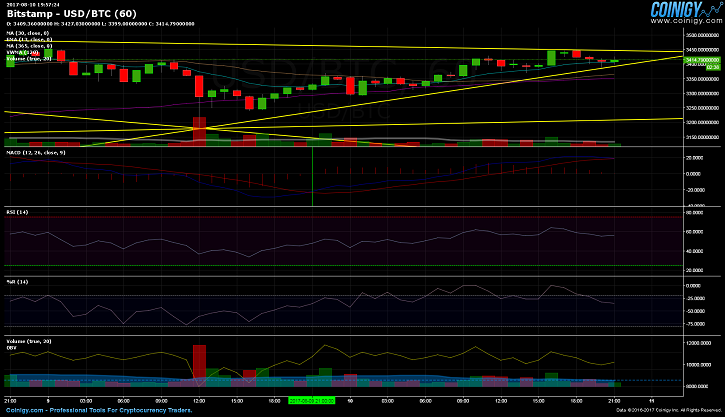 BTC/USD volume on Bitstamp appears to be stabilizing, slightly over the pre-flash crash hourly levels. Furthermore, there are two important resistance levels blocking any new gains. The first is at $3,478.41, while marginally above that, is the actual all-time high, relenting at $3,490. Both are bordering each other in close proximity, and in all likelihood, are going to be shattered in the coming hours or days. 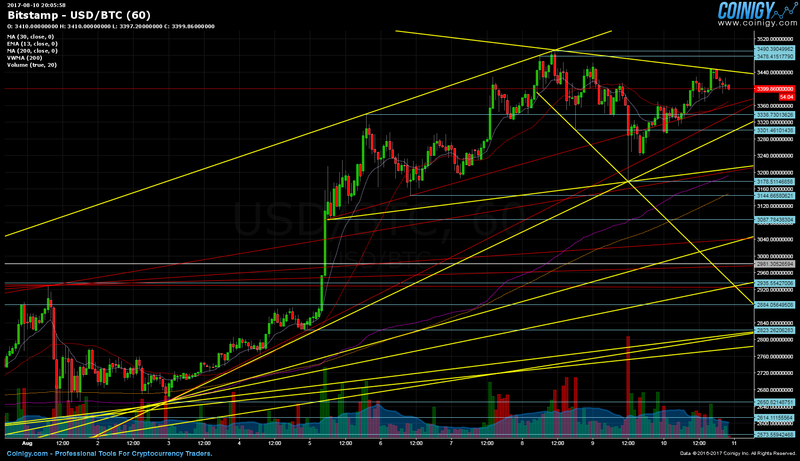 Primary support levels are at $3,338.73, and $3,301.46. Next we have the $3,178.51 support, with 3 intersecting trends lines, converging and signifying a greater point of interest. The final two footholds for the ongoing trading range, are appropriately lower from here on out, the second to last being $3,144.66, with the determinative situated at $3,087.78. Anything under the aforementioned price, brings us to the preceding $2,980 June all-time high, and consequently to the next impeding support batch affixed at $2,935.55, $2,884.05, and $2,823.26 respectively. Specific Fibonacci levels line up fairly well with horizontal supports. This is especially true for the primary footings, with the 0.618 fib (at $3,337.68) aligning perfectly with the $3,338.73 support, and the next $3,301.46 value level overhanging the 0.5 fib (at $3,290.01), even if it is by an equally marginal sum. The $3,178.51 support is adjacent to the 0.236 fib (at $3,183.49), which adds comparatively more importance to this parallel, on top of the 3 already intersecting trend lines. Daily charts show the price line hugging the upper Bollinger band. Moreover, the gap between both the lower and higher bands is getting larger; volatility may be imminent, and is possibly just a moment’s notice away. The hourly suggests that we might be witnessing the groundwork, for upcoming short-term sideways action. Distance between the paired hourly bands is also remaining constant, although the price has just touched the median line, an added drop to the underside could be taken as bearish, in the near-term. The 200-day MA is catching up to the 30-day MA, which has been displaying ranging movement in the past few days. If the 200-day MA eventually surpasses the 30-day MA, then a bearish crossover will occur. This can serve as a warning, ahead of or in case of, a probable end to the ongoing trading range. RSI is not wavering to either overbought or oversold conditions, for the time being at least; it can be best described as neutral on the hourly charts. The Williams %R is on the other hand, is gradually cascading down to oversold conditions. OBV is trending lower, with hourly volume gently increasing on average. The MACD has started to accelerate above the signal line, resulting in a bullish crossover (marked with a green vertical line). Bitcoin started trading on August 7 at $3,235.39 (GMT 00:00), before rapidly entrenching, and setting a new daily low at 3,184.68. This was soon followed by three run-ups to $3,429.23, $3,478.41, and lastly $3,490, the existing all-time high, which has yet to be surpassed. Subsequently, a sell-off ensued on August 9 (GMT: 11:00), that threw the price down to $3,178.51, before a final recoil sent us back up again, over $3,400, which seems to be enduring as support for the time being.